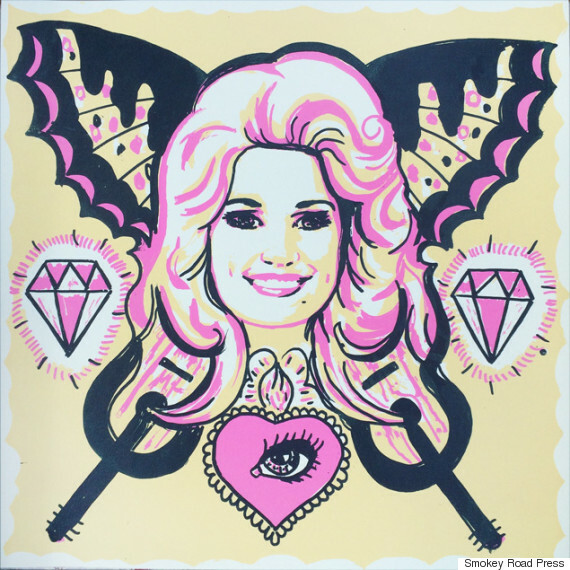 It’s hard to imagine a public figure who's inspired more fan art than country music legend Dolly Parton. 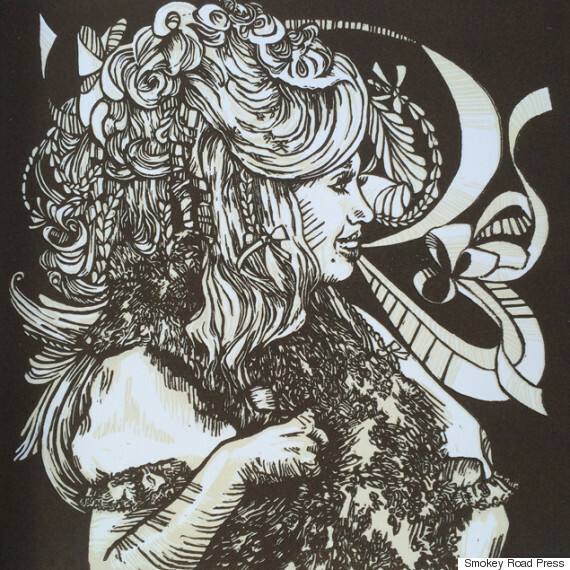 And while fan art isn't always the most eye-pleasing, that's not the case for “Tease it to Jesus," a portrait portfolio containing works from 35 printmakers. 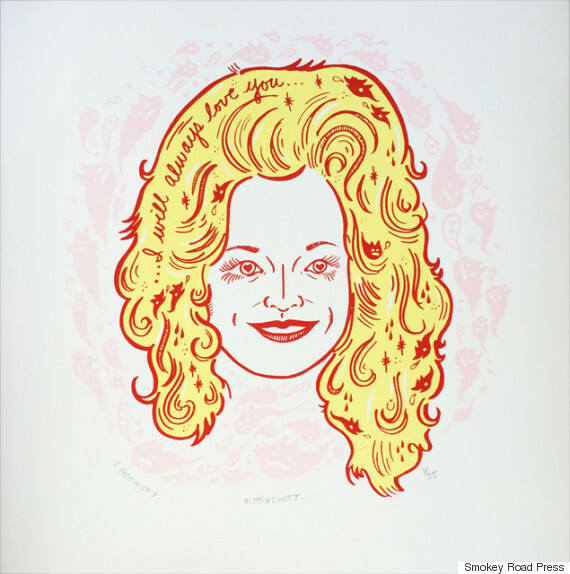 For the project -- organized by Smokey Road Press, a letterpress, binding and design studio in Athens, Georgia -- printmakers from across the country created their own renderings inspired by the “Coat of Many Colors” singer. The works will be displayed in a debut exhibition Thursday night at Pioneer House in Knoxville, Tennessee. The pieces are stunning and, yes, occasionally alarming. Rhonda Ratray, "All Seeing Heart." Screen print. 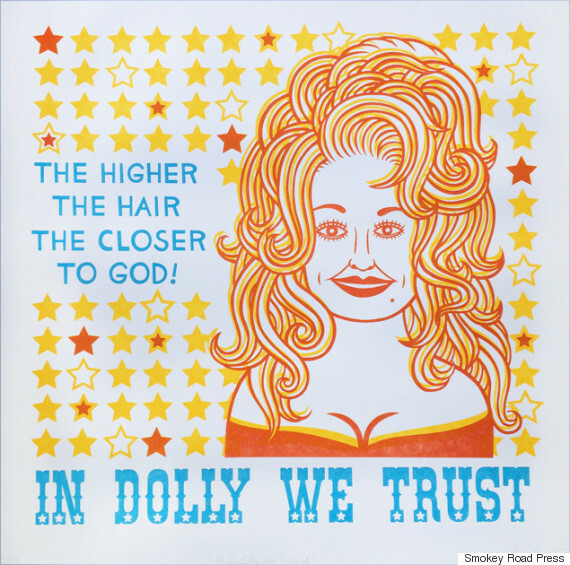 Asuka Ohsawa, "In Dolly We Trust." Letterpress. 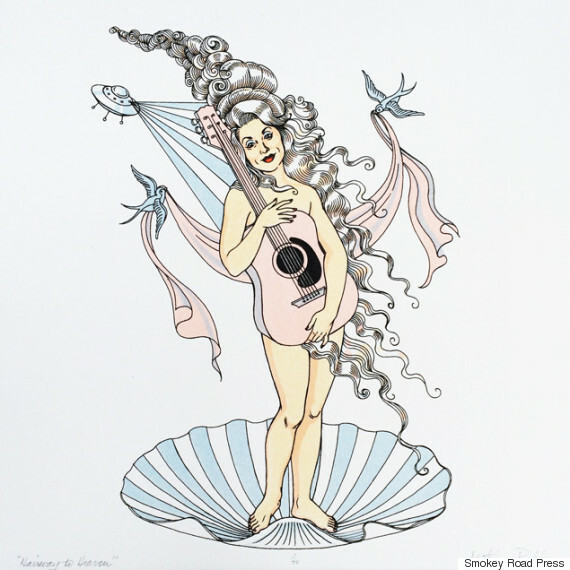 Margot Ecke, the owner of Smokey Road Press, told The Huffington Post that each year, her studio organizes a portfolio project around a specific theme. 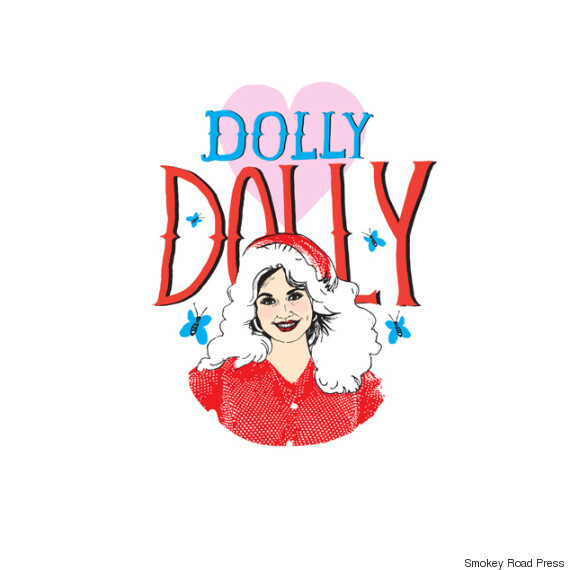 This year, with the annual SGC printmaking conference taking place about 45 minutes from Parton’s namesake Dollywood theme park, she felt a Parton theme was appropriate. 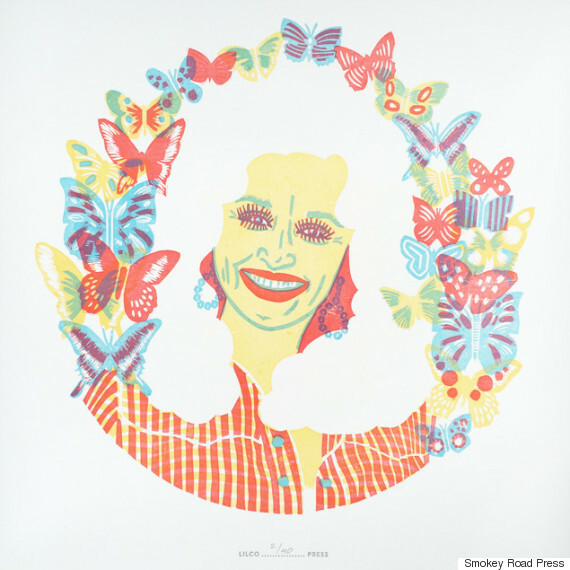 There’s one piece in the portfolio that particularly stands out to her: "Dolly" by Maren Munoz, an artist based in Madison, Wisconsin, with whom Ecke had never previously worked. Maren Munoz, "Dolly." Screen print. “It captures the over-the-top quality of [Parton's] features, and I can’t keep my eyes off of it,” Ecke said. “Tease it to Jesus” will next travel to Smokey Road Press in Athens, where it will be on display beginning April 4. It will also go on display in Dallas later this year. 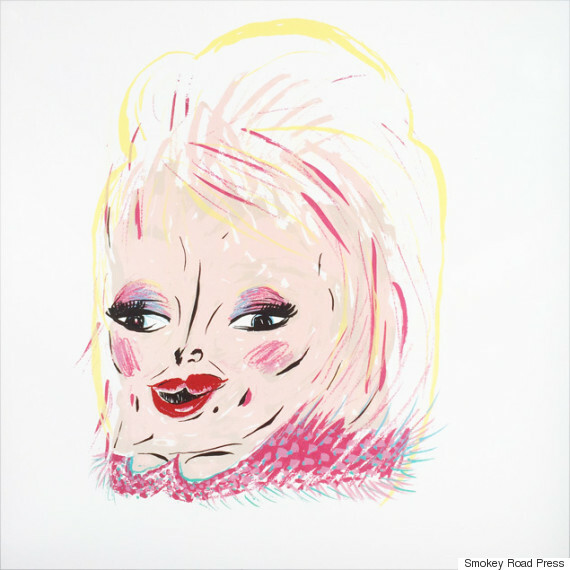 Meanwhile, all of the prints are for sale on Smokey Road’s website and through many of the individual artists’ websites. Sage Perrott, "Bittersweet." Screen print. Samantha Mosby Belcher, "Beyond Compare." Relief print. Kathryn Polk, "Hairway to Heaven." Lithography. Lily Smith+Kirkley, untitled. Linoleum relief print. 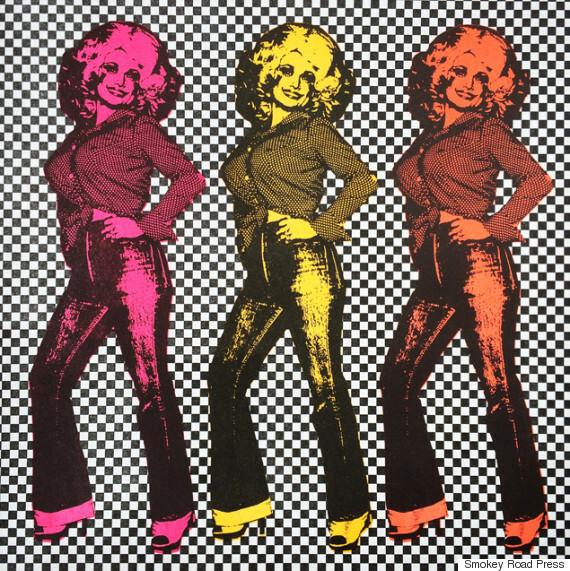 Dolly describes her 1971 hit, about her impoverished upbringing, as her favorite of the songs she has written.